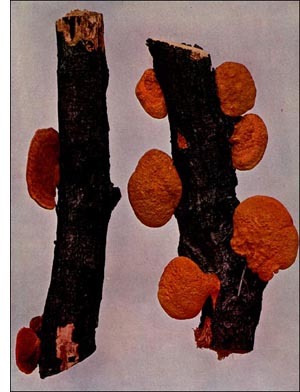 The fungus which we illustrate is not uncommon on decaying portions of oak, basswood, cherry, and other trees of the woods of many localities. It was given its specific name because of its brilliant cinnabar color, by which it may be recognized at quite a distance. Dr. W. S. Moffatt says that over one hundred specimens were found growing on a log in the woods not far from Chicago. This species belongs to a large and interesting group of the fungi family. Polyporaceae include fleshy, leathery, or woody forms. Dr. Charles McIlvaine says: "Within this large family are found edible species. In the woody species the razor-strop man finds material for his strops; the surgeon, styptics; the peasant, punk to catch sparks from his flint, and the Fourth of July urchin, a fire-holder to light his pyrotechnics. The Chinese have placed some species in their fathomless materia medica, while the polyporus of the locust tree is used in America as a medicine for horses. No fungoid growth is more universal. They are the ever-active preservers of our trees and converters of forest debris." The species illustrated is leathery, and no edible species of its genus have been reported.